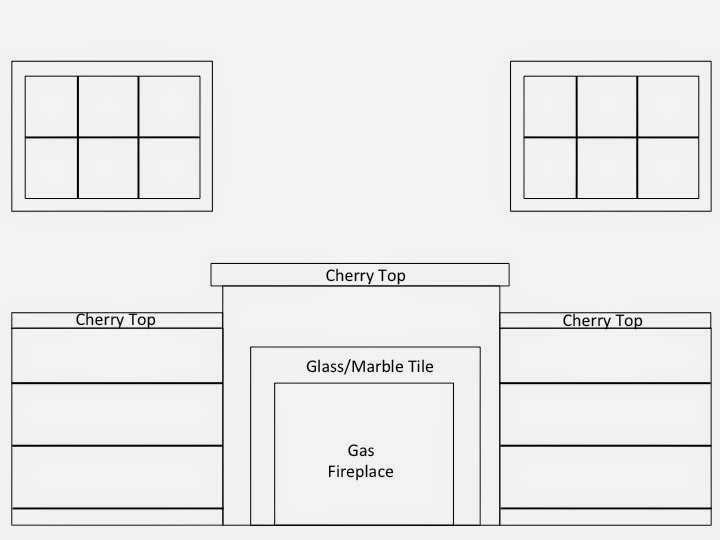 As you probably noticed from the floor plans, our first floor is essentially one big, open room. That's probably taking 'Open Concept' to an extreme, but since we're downsizing and it's just the two of us, we wanted a big space for cooking, entertaining and relaxing. But even with an open concept, we still wanted to designate 'rooms'. One big space would be boring! But how do we do that in a big space? There are some tricks to clearly define different rooms. 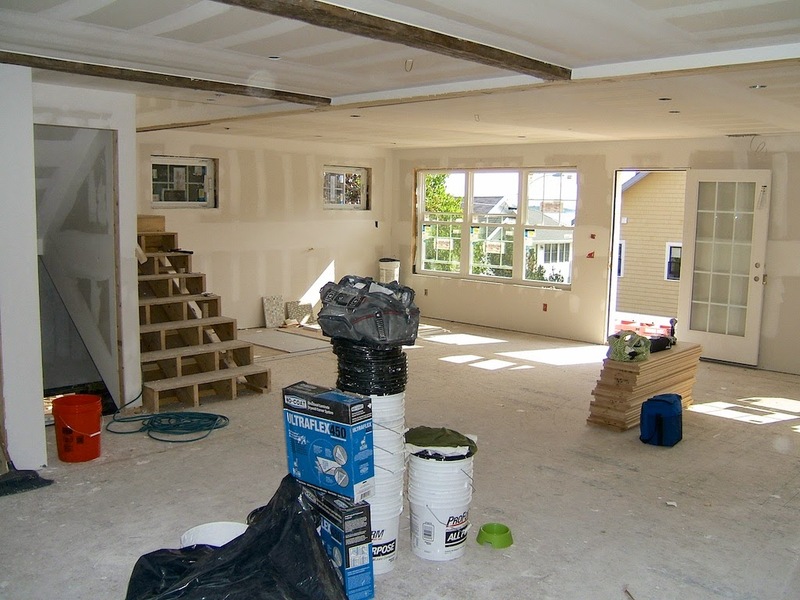 First, we started by defining the foyer and dining room - they were part of the original footprint of the house. 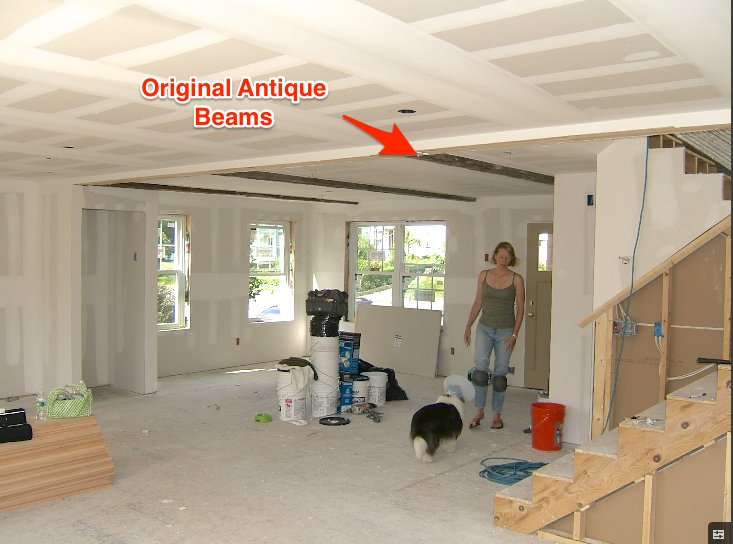 So we used the original antique beams across the ceiling. The hand hewn beams introduce a textural element with their original adze saw marks. Of course they were a perfect fit - because they were original to that part of the house. And it's such a fabulous nod to the history of the house! 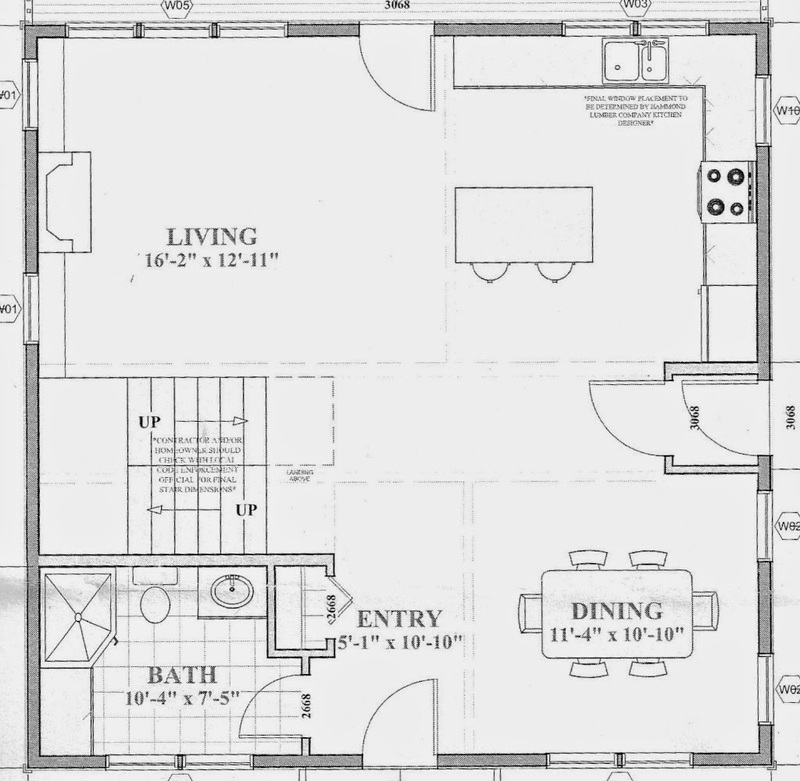 Next, we looked at the kitchen space (click here for the kitchen design). But that was easy! The kitchen was naturally defined by the island, cabinets and pantry. And since we have a large island planned, it clearly sets the boundaries of the kitchen. Don't you love a big island? It's so versatile - a great place to gather and chat with the cook. Or for entertaining, it makes a great buffet space for all the food. Finally, for the living room, we could use the staircase and surrounding walls to define the space. And we wanted a feature wall, with built ins on the primary wall. To make it cozy, we wanted a gas fireplace. 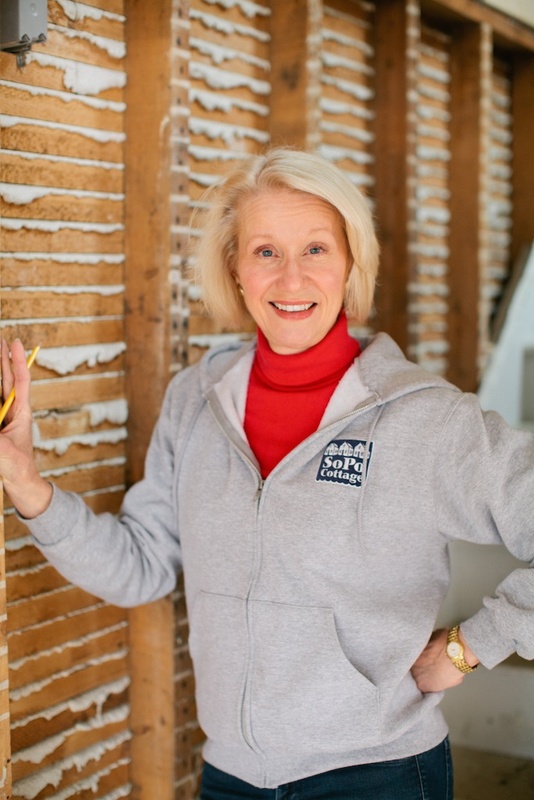 That helps keep us warm on those long Maine winters! We planned custom bookcases to flank both sides - including natural cherry tops, to visually connect with the cherry butcher block on the kitchen island. We put windows above the bookcases, to provide light, but because they sit so high - they provide privacy as well. 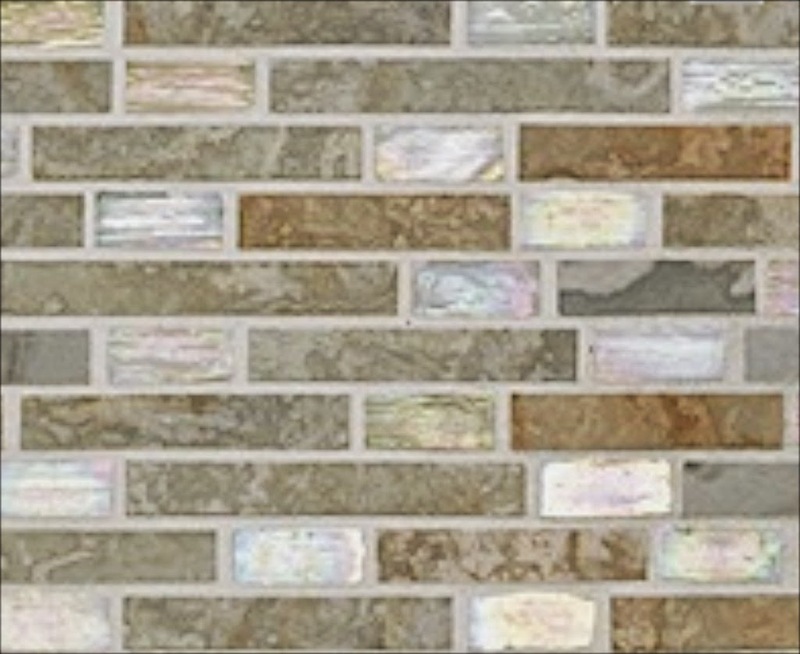 For the fireplace surround, we planned on using the same Walker Zanger Waterfall tile that we used in the kitchen - but in an elongated running bond pattern, with coordinating marble tiles on the hearth. 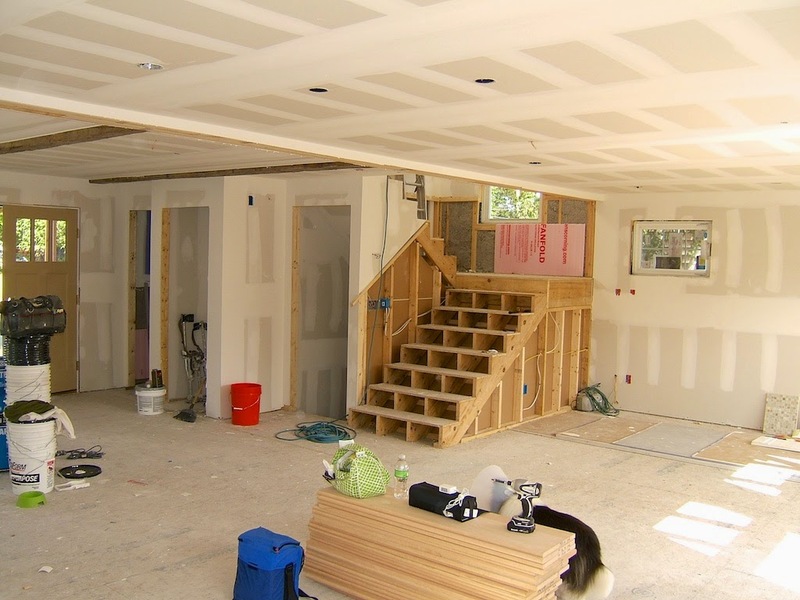 Once it's all completed, we will have that big open space, but will also have clearly designate 'rooms' for the living room, dining room and kitchen. Stay tuned for more! I am staying tuned! I am charmed by the high windows over the bookcases...what a clever idea!